Wheat is grown for consumption, whether it be by humans or livestock. For human consumption it is processed into flour so that it can be made into various different foods, the most common being baked items such as bread. Wheat is grown in many regions throughout the world since there are many available types that can adapt well to different soils and climates. However it is often sold at higher rates than other grains which makes it less common to be used for stock feed such as barley or sorghum. Therefore if you are looking to purchase wheat for human consumption you should keep the information below in mind. There are two main aspects when it comes to the quality of wheat – physical cleanliness and processing quality. The cleanliness refers to physical visual qualities such as insect damage, foreign matter (such as other grains, earth, stones, chaff), rodent evidence, etc. The processing quality refers to what end uses it can be used for. This will depend on factors such as protein, sprouted or heat damaged grain, falling number and screenings. A certified grain testing facility or laboratory that tests according to GTA standards will be able to provide you with all of this relevant information so that you can make an informed decision as to whether the wheat will be suitable for your requirements. Wheat is generally classified into two categories – soft or hard. Hard wheat is the vitreous type while soft wheat is the mealy type. It is the amount of adhesion between starch and protein that determines hardness in wheat. 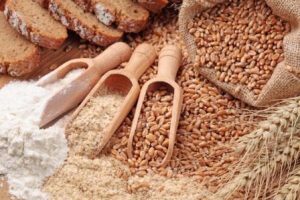 Softness and hardness determine how the endosperm breaks down in the milling process which is why wheat is sold according to many different grades. Baking quality is determined by the strength of wheat. Excellent crumb structure and a large loaf volume can be obtained through the use of strong wheat which is also rich in protein. Therefore flour for everyday use and bread production is made from hard wheat while weak wheat that only has low protein is best for biscuit and cake production since it only produces small loaves with a coarse crumb structure when used for bread baking.